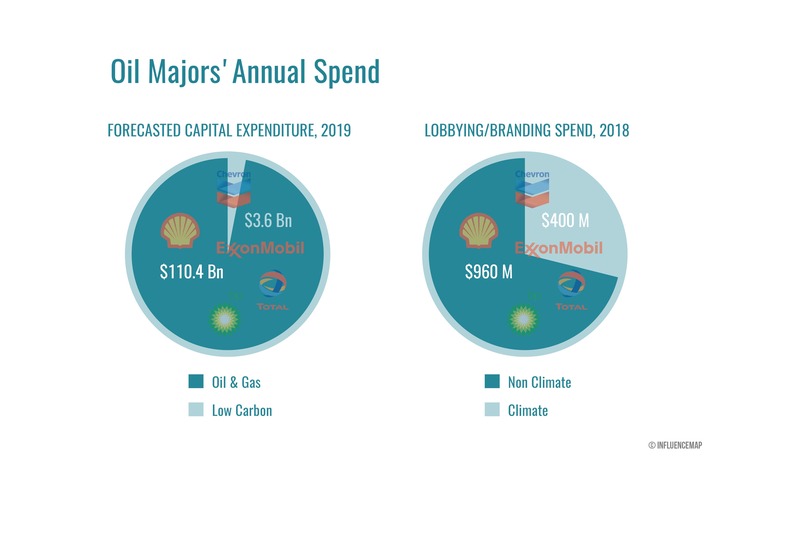 The globe’s five largest publicly-traded oil and gas majors — ExxonMobil, Royal Dutch Shell, Chevron, BP, and Total — invested over $1 billion in misleading climate-related branding and lobbying since in the three years since the Paris Agreement. However, the companies central to the report have hit back at the “fanciful” figures found in the report, which in turn raises questions about the report’s methodology, based as it is on “best-available” information. Specifically, the report finds that there is a carefully-managed trend of campaigns designed to portray positive messaging combined with negative policy lobbying on climate change in an effort to maintain public-facing support while simultaneously blocking the creation of binding policies. Somewhat unsurprisingly, the major messaging narrative being peddled by all five oil and gas majors is the idea that there is an increased need for fossil fuel production so as to meet global energy demand. It’s worth noting, specifically, the report’s focus on the oil and gas majors’ narrative pushing the need for fossil fuels in the global energy mix — as compared to the global electricity mix — and the focus on these five oil and gas majors. These companies have been making progress when it comes to electricity generation — both in the short- and long-term — but are nevertheless seeking to extend their role in the energy sector as a whole, which includes everything from vehicle fuels to heating generation. The specific spending discerned by InfluenceMap’s report is, ultimately, most telling. 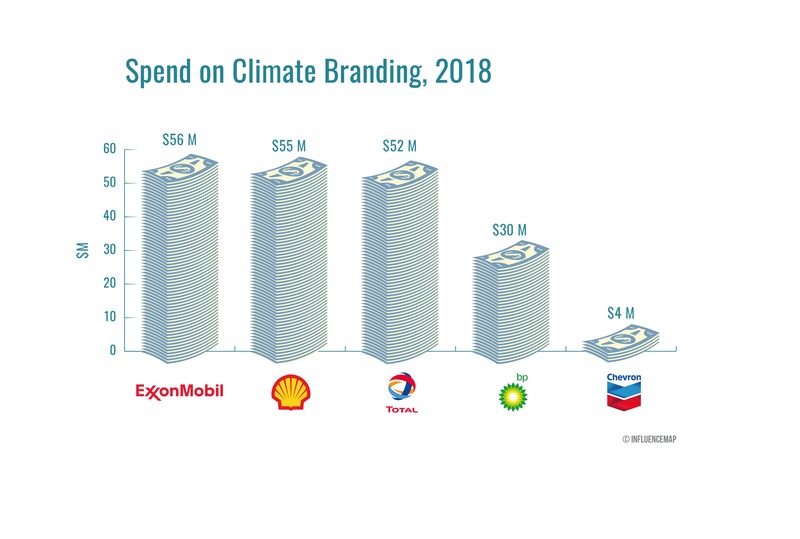 Climate branding is led by ExxonMobil, Shell, and Total, who all spent above $50 million annually — although, in terms of the percentage of the company’s branding budget dedicated to climate branding, Total leads the way with 29% of its budget. “The trillion-dollar Norwegian Oil Fund recently proposed to shift away from companies involved solely in exploration and production, allowing oil majors to dodge divestment, for now,” said Jan Erik Saugestad, CEO of Storebrand Asset Management, the largest private asset manager in Norway. “Rather than divest, the Finance Ministry has instructed Norges Bank to engage with the oil majors to ensure they invest in renewables and accelerate the clean energy transition, but lawmakers as well as other large fund managers should study closely what oil companies are doing on climate and energy policy in practice. The InfluenceMap study is an important contribution to the serious assessment which must now take place. Remarkably, these five oil majors are forecast to put a mere 3% of their 2019 capital expenditure towards low carbon technologies whilst US$110.4 billion will be put into more oil & gas. Catherine Howarth’s comments are, disappointingly, unnecessarily divisive. Companies like Shell, BP, and Total have all made significant strides in recent years — even in recent months — and have been in discussions with investors who have, by remaining involved, have been able to direct these companies to better align their businesses with the goals of the Paris Agreement. 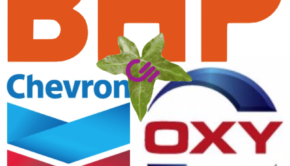 So while the report would seem to show that there is a measure of “corporate doublespeak” at work — a not unsurprising outcome, albeit disappointing and discouraging — wildly claiming “no action” flies in the face of recent announcements by Shell, BP, and Chevron, and serves only to further distance activists from having any sensible dialogue with the fossil fuel industry — dialogue which, at this specific point in time, is more important than ever. It is unsurprising, then, that the companies targeted in the report are less than pleased. “Total is fully aware of climate issues, has publicly recognized them for many years now, takes them into its strategy and deploys concrete actions in this regard,” said a Total spokesperson when asked for comment. “We reject the conclusions of the Influence Map report, according to which we use “doublespeak” because of our participation in trade associations, and which they accuse of actively campaigning against climate goals of the Paris Agreement. “Total is a member of national and international trade associations, whose names are public. The consensus required by these organizations does not always reflect our position. In this case, Total takes a pro-active approach in order to convince its peers, particularly on climate issues. In case of differing points of view, Total publicly defends its position, and is ready to reconsider its participation in case of disagreement. Total is convinced that transparency and collective dynamics are necessary to deal with climate change challenges: Total is therefore involved in multiple international initiatives such as the Task Force on Climate-related Financial Disclosures (TCFD), the Oil and Gas Climate Initiative (OGCI), the Climate Leadership Council, Global Compact and the Alliance to End Plastic Waste. “We were not afforded the opportunity to review the data but we disagree with the assertion that Chevron has engaged in “climate-related branding and lobbying” that is “overwhelmingly in conflict” with the Paris Agreement,” said a spokesperson from Chevron, who also responded when asked for comment. “We believe climate change is real and human activity contributes to it. We accept the findings of the Intergovernmental Panel on Climate Change. We see the Paris Agreement as a step forward to meeting the global challenge. “Chevron is taking prudent, cost-effective actions and is committed to working with policymakers to design balanced and transparent greenhouse gas emissions reductions policies that address environmental goals and ensure consumers have access to affordable, reliable and ever cleaner energy. All that being said, however, the corporate doublespeak must stop, and long-term business strategies which diversify these companies portfolios must be the priority for investors and company executives looking to play a meaningful part in the global transition to a low-carbon economy and, hopefully, a net-zero carbon economy.